Emirates Bank Group (EBG) is one of the leading financial institutions in the UAE, with its flagship, Emirates Bank, regularly earning first place among UAE banks in the Arab Banks rankings. They have experienced change and rapid growth. Each participant creates an individual leadership development plan, receives coaching, and practices new skills as part of a learning community. Participants are mid-level managers. They make a significant investment of time in the program, attending 21 days of classroom education distributed in 2- to 4-day blocks over a 12-month period. When not in the classroom, each is assigned to a team that works with a senior figure from within the bank, on an action learning project addressing real business challenges of major importance to the bank’s top management. Team members analyze, discuss and formulate a plan to address their challenge. 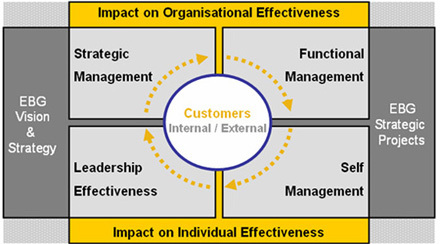 Those four themes develop individual effectiveness (each person a better leader) in the context of building organizational effectiveness (enabling the bank to reach its business destinations). By immediately applying the lessons they learn in the classroom to their team projects, the skills become real and are integrated into the way they work. The program is a demanding and challenging activity for its participants. They experiment, they take risks, and they learn from successes and failures. TheDiploma in Business Leadership program is a major strategic initiative that is critical for realizing the EBG’s vision. As program participants become more effective leaders, EBG is building the organizational capability needed to achieve its goal of substantial expansion in the Gulf region and beyond.